Andon is a Japanese term for the traditional paper lantern or signal light. In lean, we use it as a visual management system to quickly allow anyone to know the status of a line or operation. The most common type of Andon system is the three-light tower. Three colored lights (red, yellow, and green) are mounted on a pole by a work station with a switch to allow the operator to quickly change the status if anything goes wrong. The typical Andon light color-coding schema is red = stop and green = go (or running). Yellow may stand for not running at rate, ’I need help’, or something similar. These andon lights can also be mounted to machines or equipment and automatically change color based on a signal from the machine. These are especially handy when the machines are running with no operator. A smaller take-off on this method is to use a flag. If the flag is raised when someone needs help it can signal things like: low on parts, need the material handler or other types of information. The flags can be color-coded similarly to the tower lights or set for specific jobs or tasks. A common version of the flag system can be seen in doctors’ offices or clinics. Outside the examination room color-coded flags signal the staff information about the patient or what is needed next. Another more complex version of the Andon light is the Andon board. This is where several indicators are mounted on the same board to centrally locate the visual system. These are common in lean factories that have multiple production lines. This allows anyone to look at a glance how the plant is running and its current status. A pull cord is another style of andon. If an operator is having difficulties or wants to signal management that there is a problem, they pull the andon cord. This is just like pulling the cord on a city bus to signal to the driver that you want to get off at the next stop or in a hospital room where there is a cord to pull if you need the nurse. 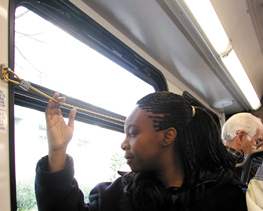 Even audible signals can be thought of as a type of andon. An alarm, bell or buzzer gets your attention when something is wrong or is trying to warn you about a situation. In the old days, at department stores the chimes you heard overhead were actually signals to floor managers to contact the office. The number of chimes, the sequence or sound was designated to different managers. This way a manager could be notified without disturbing the customers with an annoying announcement. In some lean facilities they even use the pace or rhythm of the sound to indicate if there is a problem. The advantages of using andon systems are many. To be sure, they allow a supervisor or team lead to quickly spot a problem before it escalates. For example, if a supervisor wants to know the status of six different work cells in an area, she would have to walk to each one and look or ask an operator the status. Unfortunately, while the supervisor is in the back area trying to find out what is going on, a work cell in the front has a malfunction and the supervisor doesn’t even know about it. By installing andon lights at each of the work cells, the supervisor can visually see that status and proceed to the work cell that needs assistance. 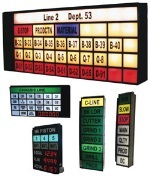 Andon lights are a low cost solution versus people waiting or not knowing the current status if work. « Lean Respect for People and Martin Luther King Jr.